Alafolix, a young gaul and friend of Asterix and Obelix, has fallen head over hells in love with the Greek Princess Irina. To win her heart he travels to Greece in the hope of triumphing at the Olympic Games. Unfortunately for him, magic potions are banned and he finds himself competing against Cesar's treacherous son Brutus. Luckily though, Asterix has a plan... Special Features English Langauge Feature Dubb, Original French Language ..
Own Asterix & Obelix - Mansion Of The Gods DVD from Deff, DVD, Blu-Ray & 4K Video Specialists - Free UK Delivery.. When Cleopatra bets Julius Caesar that she can build a sumptuous palace in record time, Edifis the Architect is driven to desperate measures to get the job done (or risk being thrown to the crocodiles!). With the help of his friends Asterix, Obelix and a magic potion from the Druid Miraculix, he must win the challenge against all odds. Starring Christian Clavier and Gerard Depardieu as Asterix and Obelix, Amelies Jamel Debbouze as Edifi..
Rather than revealing any of the numerous incidents in the story, let’s just say that Asterix, Obelix the brave Gauls and the mean Romans are in it as well as the whole host of Rene Goscinny and Albert Uderzo original characters, all playing their traditional roles. 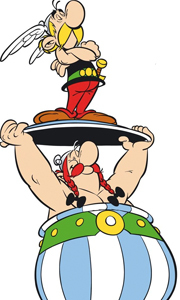 For the first time Asterix will here swing into battle with Obelix… Obelix will turn Asterix in to the Romans… Asterix will restore the fallen Caesar to power… Tunnabrix wil..